The upward and onward march of English wine continues apace. True, there are some increasingly convincing still wines, like the Lyme Bay Shoreline, a former Wine of the Week, but it is the sparkling wines that undoubtedly set the pace, both in the UK and increasingly on a global stage. With 2016 being touted as potentially one of the greatest ever vintages for English wine with a long, hot and relatively dry late summer and autumn, the future looks bright. English sparkling wine is made by the traditional method, which means the secondary fermentation takes palace in individual bottles, most top wines being a blend using Champagne’s three main grapes: Chardonnay, Pinot Noir and Pinot Meunier. 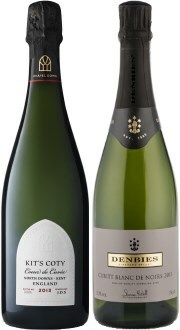 There is a sometimes bewildering array of new estates and new sparkling wine brands hitting the shelves, though thankfully quality does not seem to be diminished by that. This tasting features wines from five different estates, carrying very different price tags too. Nyetimber is the daddy of them all, and synonymous with the rise of the quality English sparkling wine industry. In contrast, the Goring Brut is the first ever release from a new project from ex-Nyetimber winemaker, Dermot Sugrue, in conjunction with Wiston Estate. Henners is owned by ex-Formula 1 engineer Lawrence Warr, who sought advice from the vignerons of Champagne before planting his vineyard in May 2007, then we have two more of the big names of English sparkling wine, Denbies and Chapel Down. Denbies was first planted to vines in 1986 and now has 265 acres of vineyard, which they say is three times bigger than any other in the United Kingdom. Chapel Down in Kent produces beer and still wine too, but they are clearly ambitious with their sparkling wines, their Coeur de Cuvée selling for £100 per bottle. I’m delighted to say that both Nyetimber and Wiston Estate will be pouring their wines at my Festivals of Wine 2018. (2017) Made from equal parts Chardonnay, Pinot Meunier and Pinot Noir by the hugely talented Dermot Sugrue of Wiston Estate, from Wiston fruit and fruit of neighbouring vineyards, this has a gentle note of toffee and nuttiness to otherwise very pure and clear fruit, the rolling but crisp mousse leading on to a pristine palate, fairly straightforward, but deliciously mid-weight with its sense of roundness and excellent acidity. (2017) An out and out bargain at D Byrne’s price, this Blanc des Noirs blend of Pinots Noir and Meunier has fine toasty and bready, autolytic development. Plenty of small bubbles and crisp apple fruit add to the appeal, and on the palate it has a gentle attack: not sweet at all, but softer than some English sparkling wines, the 5 years of lees ageing having smoothed and rounded the acidity into a long, balanced finish of great poise. (2017) When Nyetimber introduced the first vintage of their single vineyard Pinot and Chardonnay blend last year it raised many eyebrows, ambitiously priced at £75 - £90 depending on stockist. 4117 bottles of this 2010 have now been released (this was bottle #60), the colour a pale green with gold inflections, the nose very Champagne-like with biscuit and lightly yeasty aromas and then baked apple and a fresh citrus note too. In the mouth it is bright and clear, those fresher notes of clean, cut apple and lemon and lime, fine acidity and just a lovely hint of the sweetness of the dosage and gentle toast in the finish. (2018) All Chardonnay, and also 'zero dosage' with only 1g/l of residual sugar, this was aged for 6 months on lees before a further 27 months on lees in bottle. That has given a subtle yeastiness and toast on the nose of this pale wine with moderately persistent, small bubbles, but the aromatics are of sharp, fresh apple and citrus. The extended ageing is a good thing on the palate too, because the wine remains sharply focused and incisive, a green apple bite of acidity running through it, a lick of salt and lemon juice minerality, but just enough breadth and creaminess to leave it deliciously moreish, though well-delineated into the finish. (2018) Made from hand-picked Pinot Noir from Denbies' the Hillside vineyard in Surrey, this wine had considerable ageing: six months on the lees in tank followed by 27 months of secondary fermentation in bottle. The result is a wine with a nice golden glow to its pale colour, and hints of richness to the otherwise bright and vivacious personality. Small notes of red fruits join the lemon and bruised apple, then a dry, lemon and salts acidity is emphasised by its very low dosage (only 4.2g/l residual sugar), so it is keen and apple-fresh into the finsih. (2017) From Chapel Down's single vineyard on chalky soils next to the Kit's Coty neolithic monument in Kent. It's all-Chardonnay and from and excellent vintage, and partially barrel fermented. Lots of streaming bubbles and a gorgeous nose, a hint of custard cream biscuits, full and generous with ripe apple and a hint of fragrant lime rind. The palate has a full mousse, very easy and approachable sweet fruitiness, but a streaking, pithy lemon and mineral acidity. Long and delicious, but with a serious side. (2018) From the 'heart' of the blend, this is both a vineyard selection and a juice selection, made from the best Chardonnay blocks and only the first 'cut' of the finest juice from the pressing. Fermented in oak barrels with wild yeasts, it has a moderately low dosage of 6g/l. It's such a different beast from the regular Blanc de Blancs, leesy, earthy and 'dirtier' on the nose, which is part of the wild and barrel-ferment character, and makes up in complexity for what it lacks in the BdB's pristine clarity. The palate has that chewy complexity too, mouth-filling and serious, the choice here is not only about price, it's very much about style. I found the Chapel Down Vintage Reserve Brut for sale in a Pennsylvania USA state store back in August at $39.99 a bottle. It’s the first I’ve seen English wine here. I wanted to try English wine previously, but shipping per bottle direct from the winery was exorbitant. Needless to say I was thrilled to find it, thought it quite nice, and gave it a B+ on my personal scale. 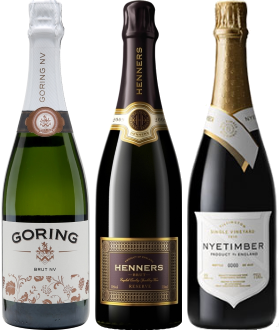 Great Ned – I’m not sure if English sparkling wines will ever get a wide distribution in the US, but quality is getting better all the time it seems. $39.99 seems OK for a bottle that’s made it all the way to Pennsylvania I think, as the wine would be the equivalent of over $30 here, so hopefully you will discover a few more on the local shelves. Chapel Down Coeur de Cuvée is mid-spelt. Am I sad or what?